In October 2010 it was reported that as part of the Big City Plan looking at regenerating Birmingham's central core that City centre street could become car free zone. 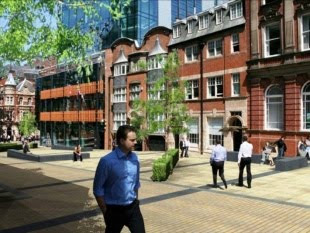 The plans, first developed in 2008, were announced between Colmore Business District Group and Birmingham City Council to create a public space, Church Street Square, with widened pavements and priority for pedestrians on a section of Church Street linking the Jewellery Quarter and Colmore Business District. Colmore Business District is one of five business Improvement Districts within the city, including Broad Street Partnership Limited, Retail Birmingham, Colmore Business District (CBD), and Southside Business District, where businesses in a geographical area invest collectively in local improvements and services financed through extra levies made to councils based on occupants' standard business rates. A year on from these plans in October 2011 work is due to start on creating this new square after a report of the Director of Planning and Regeneration to the Cabinet Committee (Procurement) of the 7th July saw approval of the £811,700 proposal. The Colmore Row BID, Business District Limited (CBD Ltd), will secure up to £250,000 of match funding in support of the Church Street Square project against £505,100 of City Council capital. The total capital cost of the project is £743,900 (including works and fees). This will be funded through Transport, Environment and Regeneration Portfolio capital resources of £505,100, £47,300 from TCPA S106 monies, with £191,500 from CBD Ltd (from a total contribution of £250,000). The plans will see the road in the centre part of Church Street reduced in width by 5 metres on average, creating a single one way running lane, and the new public realm paved using Yorkstone and Irish blue limestone for seating areas and the planting of six new trees. Street lighting columns will be replaced by building mounted floodlights. The footpath on the north east side of Church Street will increase from 2.5m to 7.5m at widest point. • 25 sq. m. soft landscape. • 6m sq. of tactile paving. A competition will also take place to design an art feature at a cost upto £19,000 with the winning design chosen by a panel made up of members from the City Council’s Planning and Regeneration service, Museums and Heritage Services and CBD Ltd.
Pictures of the proposed development and a plan showing the layout are reproduced below from the Council report to see the plans. Indicative image from 2010 of the proposed square.